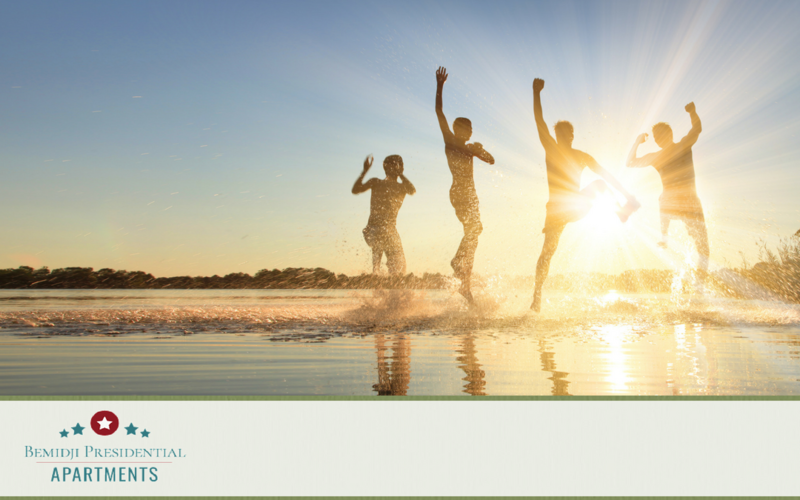 We hope you love the inside of your apartment as much as we do, but we also hope you take the time to get outside this summer and check out all that Bemidji has to offer. Whether you’re looking to soak up the sun lounging by the lake or get your sweat on while trekking the trails, you can find your perfect outdoor adventure right next door. If your adventures happen to involve boats, RVs, or other recreational vehicles, we have the perfect parking solution just for you! Our overflow lots have reserved spaces for tenants to park their toys – no more renting storage space or searching for free parking lots. So slather on the sunscreen and let’s get to it! Not only is Bemidji home to Lake Bemidji, it’s also dotted with ponds, bogs, and rivers perfect for water sports and R&R. Paddle away through one of the local marshes and enjoy seeing wildlife like bald eagles, deer, and turtles. Don’t have a boat of your own? Guided boat tours are offered that explore local history, Minnesota lakes, or the Mississippi River. If you’d rather slip on a suit and jump right in, Conde Nast Traveler has named Lake Bemidji “One of America’s top 100 swimming holes.” Access to Lake Bemidji swimming beaches can be found at Cameron Park on the west shore; Diamond Point Park at Bemidji State University on the west shore; and Lake Bemidji State Park on the northeast shore. Or, check out the beaches at Itasca State Park, where you can literally walk across the water to the Headwaters of the Mississippi! Fishing enthusiasts will “reely” love casting away at Bemidji Lake, known as one of the top fishing lakes in Minnesota. Whether you’re on two feet or riding two wheels, Bemidji’s eight varied trails ranging from 6 to 160 miles will suit your needs. Take a nice stroll downtown and grab a bite to eat or ride through one of the parks and enjoy the lush scenery. Don’t own a bike? No problem! Rentals are available. Bemidji is home to Lake Bemidji State Park and Itasca State Park. 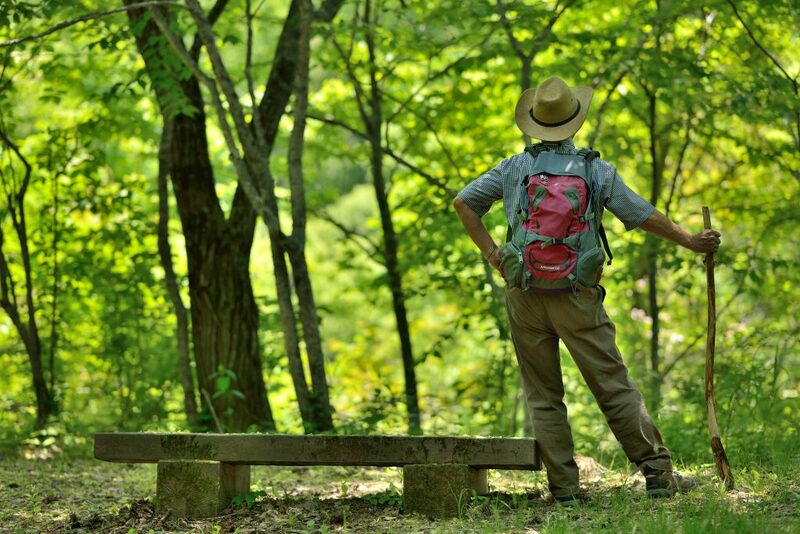 Both offer walking, hiking, and biking trails as well as outstanding views. Whether you’re in search of an early morning stroll or a challenging afternoon 12-mile trek, you can find it. Get swinging at one of Bemidji’s three scenic courses: Bemidji Town & Country Club, Castle Highlands, and Greenwood Golf Course. All three accommodate golfers of all skill levels and promise a day’s worth of sun, a handful of lost balls, and the possibility of a hole-in-one. If off-roading on an ATV is your thing, look no further. Pack your bags and load your ATV (directly from our overflow lots!) 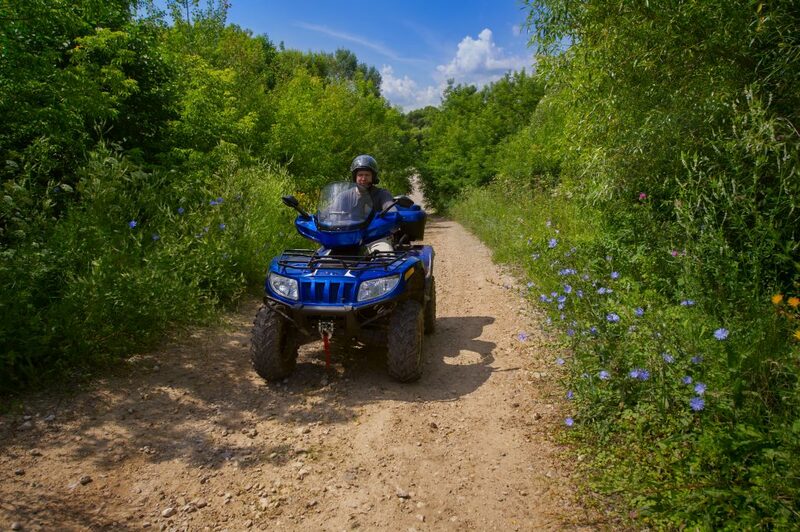 and head for the Schoolcraft ATV/OHM trail, named one of the best trails in Minnesota. The diverse landscape, with scattered bogs and bonds, is perfect for an afternoon adventure. Not a fan of two wheels and would rather be on four? Bemidji boasts a 14,000 sq. ft. skate plaza located in City Park. Shred away. If you’d trade in your clubs for a disc any day, head on over to Bemidji’s 18-hole disc golf course named one of the best disc golf courses in northern Minnesota. Hunters looking for deer, grouse, waterfowl, and more will love the opportunities Bemidji has to offer. Looking to get even wilder? Take a guided wolf or bear hunt, or try one of the area’s hunting preserves. So grab your gear and get outside! A world of adventure awaits you, right here in Bemidji.